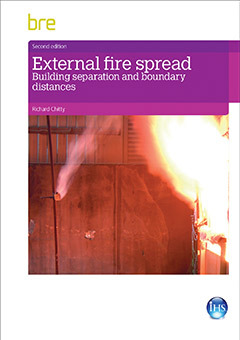 During the revision of BRE Report BR 187 (External fire spread: building separation and boundary distances), it became apparent that the methodology and some of the assumptions may not be valid for some features in modern buildings. 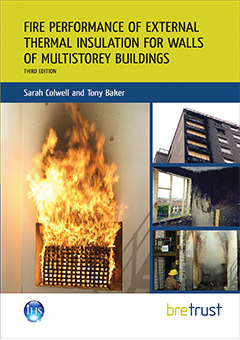 This Information Paper therefore reviews existing fire compartment temperature calculation methods and presents methodologies for assessing the sensitivity of the parametric approach to variations in fire load, window size and insulation of compartment boundaries. Analyses on how these changes affect the building separation distances are summarised. In addition to the current ‘steady state’ assumption inherent in BR 187, probabilistic and time-based approaches are also considered. The parametric temperature–time curve was used to illustrate the sensitivities of the separation distance calculations to the different variables and how these might be considered as part of an overall engineering design solution. 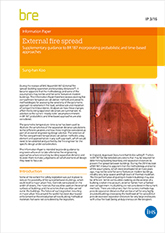 The selection of the fire compartment temperature calculation method is a key element and approximation in any such approach, which would need to be validated and justified by the fire engineer for the specific design under consideration. 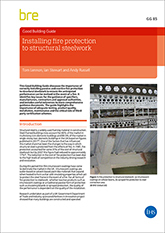 This Information Paper is intended to provide guidance to engineers who wish to take alternative fire engineering approaches when calculating building separation distance and to assist them to make judgements on which elements of design they need to focus on. BR135: Annex B. 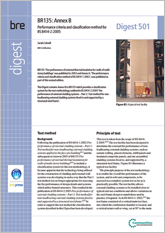 Performance criteria and classification method for BS 8414-2:2005.